Welfy is an orphan failed by the welfare system, who runs away to live in the big apple, New York City, but don't let that put you off. He decides to relocate and leaves his various children's and foster homes behind to make his own way in the world. I don't think most of us could blame a boy who had lived in 31 homes in 2 years for trying another solution. Bargaining his work skills in exchange for food might not exactly be an ideal way to live his extremely young life, our hero doesn't know it yet, but he is about to embark on a dangerous adventure with Baloney. Welfy, meets young Harlan, who lives under a bridge and they soon become firm friends. Harlan shows him the ropes and helps him adapt to life on the streets and in exchange Welfy shows Harlan how to dodge deadly missiles which look remarkably like ketchup in an alternate universe. 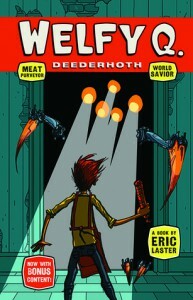 Aimed at everyone aged over 9 who likes reading about heroes, or even meat products. I may not be in the target age group that the author was aiming for, but that certainly never stopped me before. An enjoyable adventure with lots of death and action, I see no reason why this book cannot be enjoyed by both genders of Junior school age. There is a fitting end, but plenty of scope exists if the author decides to give young Welfy another outing, and I hope he does. This copy was received from the publisher for an honest review.